Soul's Thought of the Day Email List came about as the result of my "Thoughts Of The Day" posts I was sending out to my many email lists from 1996-1999 and there are some that I have written on my Blog Often when people have decided to unsubscribe from a list they have written to ask me if they could still receive my "Thought of the Day" posts. My soul's Thought of The Day list was born from the requests of of people who were on various email lists I used to run. For a few years, from 2000 to 2004 I wrote my "Soul's Thought of the Day" for over 3,000 people who subscribed to a list just for the "Thought of the Day"
I am now, in December 2009, I now have a Daily Meditations/Thoughts Audio Podcast that will take the place of my old "Thoughts of the Day". Inspiration can be a very individual thing. We can also, however, find our own individual inspiration from many a collective thing. What inspires you? Does what inspires you speak to your soul? Does it motivate you to want to create the kind of change that you may need and/or want in your life? Are you in pain? Do you feel lost? Stressed out and overwhelmed? Do you need more self-awareness in your life so that you can feel more at peace, calmer, and more fulfilled? If so, you will benefit from reading my inspriational, reflective, and thought-provoking thoughts. They are thoughts that soothe, challenge, motivate, inspire, and sometimes teach here and there too. "PHOENIX RISING REFLECTIONS" is the first in A.J Mahari's Motivation and Inspirational ebook series. There will be many more ebooks to come. This ebook, available now, has 80 inspiring and motivating reflections designed to help you get in touch with your inner-most feelings and thoughts. These reflections will give you grist for the mill of your soul as you continue on your journey toward the rising out of the ashes of your pain, suffering, lostness, or any challenge that you may currently be facing in your life. Be a PhoenixRising and reflect upon the nature of your present circumstances. The journey that has brought you this far and what you may need to become aware of in your own life to help you clarify what it is you need and want out of the rest of your life. This collection of 80 reflections will absolutely get you thinking in ways that will open up your awareness. You will be moved and encouraged to think more about what you value, what you cherish, what you need. 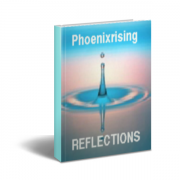 Purchase your copy of PhoenixRising Reflections Book One and treat yourself to A.J. Mahari's soul-inspiring writing.